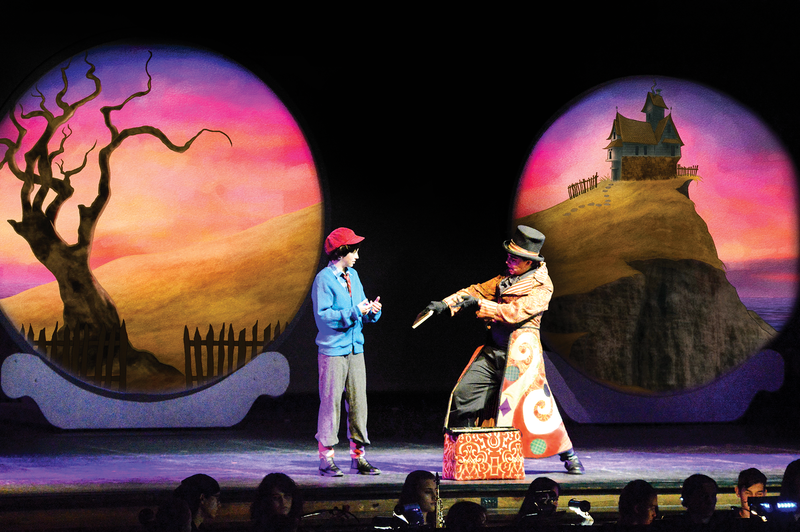 This composite photo shows the watercolor-style projections behind Poudre High students playing James and narrator-conjurer Ladahlord. Photo by Mina Delgado and Mitch Stark. "Maybe it started that way. As a dream." 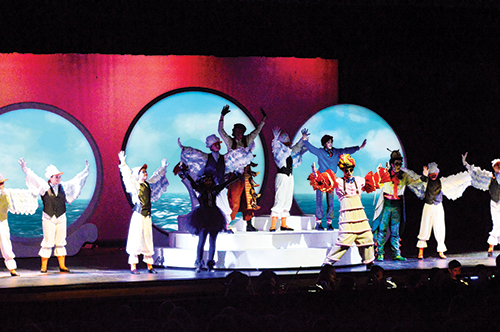 Poudre High School, though limited in space and resources, is known for its robust and creative theatre program. Among past productions are shows including a bilingual Romeo and Juliet, The Laramie Project, and last year’s Zombie Prom. In March 2018, Smith started looking for a new challenge — a show that would appeal to a broad audience while providing new artistic opportunities for his student technicians and performers. He chose James and the Giant Peach. 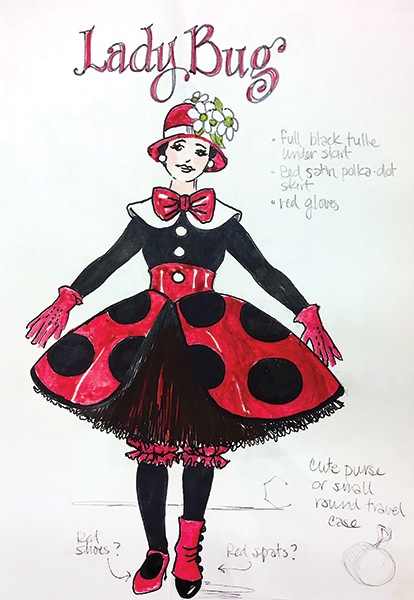 These costume renderings of Grasshopper, James, and Ladybug (below) by Kari Armstrong were inspired by student sketches. Smith announced his show selection in April, and Armstrong began drawing and painting ideas for Peach the next day. 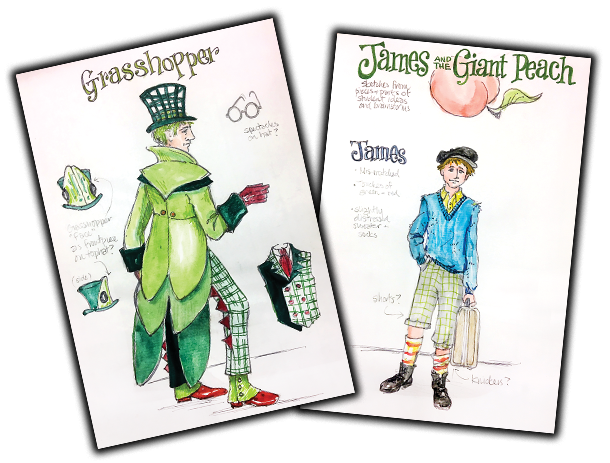 She recruited several of her costume students to begin dreaming up the look of James, his magical insect companions, and a host of other characters. The students were so enthusiastic that they produced character sketches throughout the summer. “Using clues from the script and book, we went back and forth about the time periods and countries that would influence each character’s look,” Armstrong said. “We decided on more intense and kind of cheeky color combinations to add a little more snap and fun.” She helped the students refine their illustrations into the final look for the characters. “One of the many reasons we chose James and the Giant Peach was that we were going to have to build these costumes,” said Smith. “These were not things that we were going to be able to pull off a rack. Sometimes a show calls for normal street clothes, and you’re just pulling stuff out of inventory or combing thrift shops to find the pieces you want. But if you give students the opportunity to build something from scratch, there’s an excitement that goes along with that. I think there’s also a fear that goes along with that too, because they are making something that wasn’t there before.” During Peach preproduction, this sense of both community and the “bizarre” rolled quickly and seamlessly through all elements of the design collaboration. "Try looking at it another way." For example, to create a matching digital projection of the magic bag (stocked with potion recipes, glowing crocodile tongues, and the promise of a better life for James) wielded by narrator Ladahlord, Nichols scanned the prop bag developed by Armstrong. This ensured that both prop and projection echoed the blended maroon and gold coloration of Ladahlord’s whimsical coat. For Nichols, it was important to coordinate the patterns, shapes, and colors of the projection art “to make sure everything melded together and wasn’t just random images behind the actors.” She animated her digital creations so the bag would spin and shoot smoke. This dynamic special effect splashed behind the song “Shake It Up” while the actor playing Ladahlord used the prop bag onstage. To push collaboration further, Smith and Armstrong challenged the costume team to use the songs and sound design as inspiration to look outside the bounds of traditional British fare and adopt a more global look for the characters. Often, the student costumers would sit in the audience during rehearsals, listen to the musical numbers, and watch the staging and choreography to better inform their costume choices. Student costumers designed Copacabana sleeves and a headdress for Earthworm's performance of the salsa number "Plump and Juicy," shown here with a composite of the projection design. Photo by Mina Delgado and Mitch Stark. Once the projections at Theatre Avenue were complete, Nichols took the final animations and integrated them into QLab on a single Macbook. She used a three-way splitter so they would perfectly strike each of the three screens. She and Smith worked back and forth to adjust their placement until the projections gelled with the lighting and staging. To make Spiker as vertical as possible, the team extended her height with the use of a 1960s-style beehive wig. For Sponge, they went the opposite direction by caricaturing her hair into horizontal pigtails, like Princess Leia with one finger in an electric socket. The Poudre High costume department sent sketches and wig photographs to Theatre Avenue, where artists replicated the hairstyles for a full green-screen film shoot with the aunts. The final projections depicted a nightmare sequence in which James’ aunts loom in the clouds, taunting and teasing him as an angry sea rages below. Smith showed the projections to his team. His actors for the aunts were inspired by the gestures of their projection video counterparts. They integrated some of those moves into their performance onstage, completing the collaborative loop. 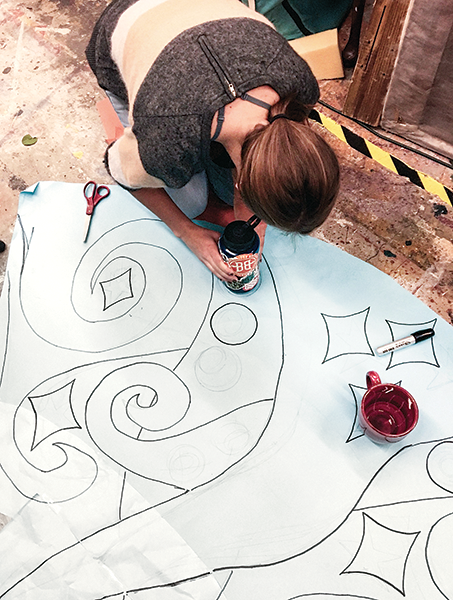 Student costumer Ranier Kahl works on the design for Ladahlord's coat, which informed both props and projection designs. Photo by Kari Armstrong. "I dreamed about coming here. And then I did it!" The efforts of Smith, Armstrong, and their team of actors and technical artists culminated in a fully ripe show on October 26. “To see the costume crew beaming with pride when the dazzled audience recognized their exceptional work — well, that is my reason for teaching,” said Armstrong. The cast and crew — costume shop, props department, projection team, and more — united through hard work and deep camaraderie. This is a magic of sorts but also something real that will serve the school’s theatre department long after the last applause dies down and the final set piece is struck. When asked if he plans to take a similar approach in the future, in terms of complexity of both script and technical collaboration, Smith grinned. “Absolutely! You see these kids take incredible risks with character and understanding and empathy. You see the amount of courage it takes to put yourself out there. You see kids really create and grow and learn, and not because I’m telling them to but because they’re invested and they’re passionate and they’re honest. It’s thrilling, and it’s awesome every time.” Wander into a Poudre High School theatre class or rehearsal any day, and you’ll find magic woven everywhere.